So recently, it came to light that a co-garden member had made his own apple cider press, and (having pressed all the apples he could) was willing to lend it out. Apple cider is awesome - especially with cinnamon and spiced rum - and so we quickly put our name on the list, and a plan was born. Now, someone back in Peterborough's history clearly loved apples, and to this day there are apple trees growing all over the place, if you know where to look. No one I know here buys apples in the fall. Its wonderful. We picked up lots of apples from the ground (which traditionally, are the apples you would use for cider), but couldn't resist doing some tree climbing. The apples were smaller then the ones you would buy from the store, but they were sweet, and awesome, and free. I think we filled every bucket and pot in the house with apples - and barely made a dent in the tree. 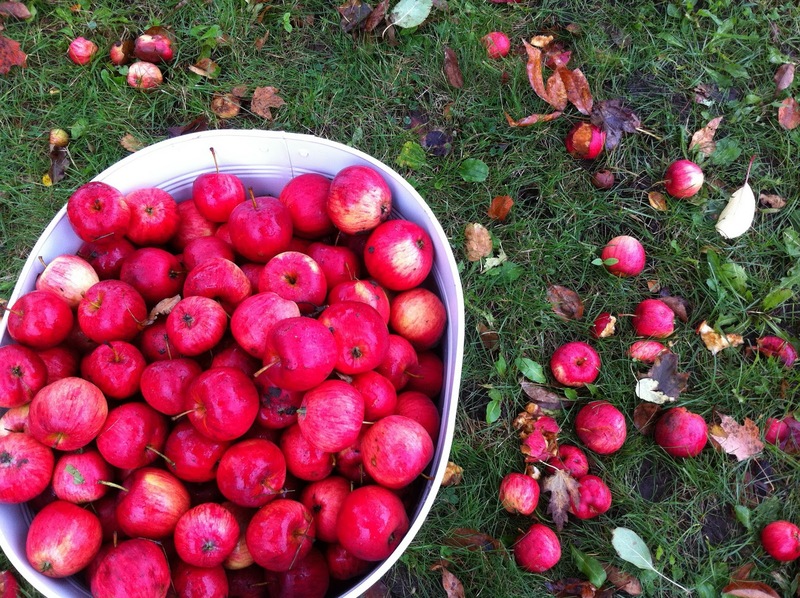 We did a quick wash of all the apples in the bathtub, and then moved into serious apple cider production. I cannot underscore how badass this cider press is. It had two main parts, a garborator, which is used to munch up the apples into a fine pulp, and a bin, where the actual pressing happens in a few stages: a) wrap the pulp in muslin bags, maybe 5 of them. b) sandwich those bags between plexiglass sheets (cutting boards, it turns out, works too). c) put your pulp/plexiglass many layered sandwich in your large bin, and d) stand on top of the sandwich and watch the apple cider pour out. There was originally a tire jack for this purpose, but no one could figure out how to use it, so we substituted human body weight instead. Aaand it was that easy! 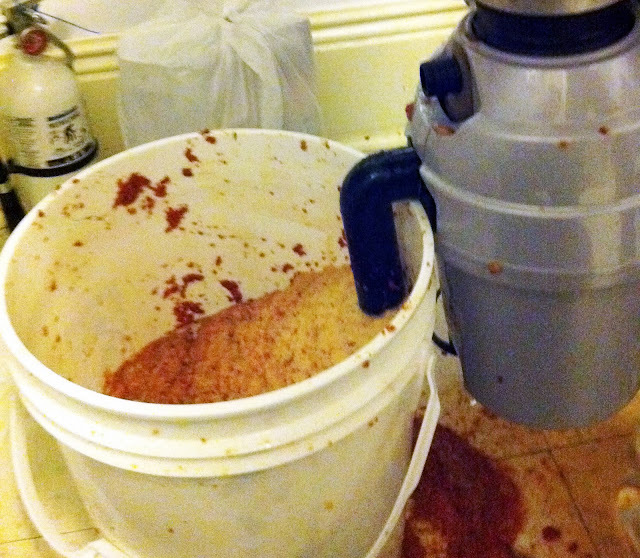 Apple cider = apples, mushed up and squeezed. Presto. Ok, so it wasn't pretty. It was actually a total disaster (the awesome kind). I could barely take this photo because my hands were so sticky (and the floors, and the walls..) and there was pulp flying everywhere. Unfortunately, non of the photos I took of the pressing process even remotely turned out. It might have been the pulp, the laughing, or the copious amounts of beer we were drinking at the time. It was a pretty glorious mess. But isn't that what the best projects are all about? In the end, we made about ten gallons of apple cider. I'm not sure why, but our cider turned out strangely velvety - much more so then the apple cider you buy in stores. It could be because we were drinking it unpasturized, or maybe it was because of our somewhat unconventional pressing techniques. Either way, I like it! About half of the cider headed home with friends of ours to become hard apple cider, and we made some of ours into apple cider molasses (post to come! ), the rest we canned in a hot water bath for about ten minutes, with two tablespoons of lemon juice - so that even in the darkest days of winter, there will be hot apple cider and rum. It's actually the very best apple cider I've had in my life. Something about it being thicker helps balance out the acidity, and it's delicious. I know that at the time I said that we may have bitten off more than we can chew and never wanted to press apples again, but I take that back entirely. I feel like now that we know what we're doing, round 2 should be totally smooth.